Releasing a debut album five months after the tragic death of a band is a touching tribute to work that couldn’t be completed. Encouraging reviews of said release is a ballsy test of media/artist relations. Viola Beach’s debut album—hastily compiled of studio recordings and live sessions—poses an interesting question when it comes to musical critique. How far is too far when you’re criticizing a band who fell to their deaths from a Swedish swing bridge a mere five months ago? Those who have encouraged this release avoid a huge conflict by compiling some talented, and sadly promising tasters from the young band. Inevitably the tracks will be well known to existing fans, while second and last single “Boys Who Sing” was introduced to the wider music scene when Coldplay recited the track during their headline Glastonbury performance. 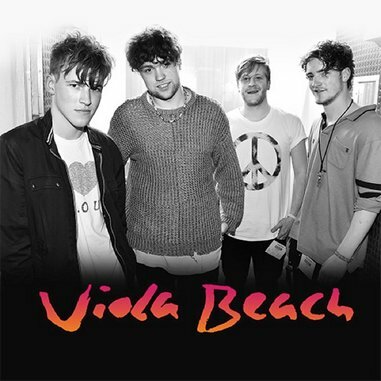 A nationwide campaign was also launched shortly after Viola Beach’s death to get the song to Number 1 in the UK charts. It failed, but the momentum behind the release and the sincere attention Viola Beach’s music has received since their untimely deaths proves their indie rock charm had potential. The self-titled album launches with the epic sounding “Swings and Waterslides,” the band’s debut single. Charged with buoyant guitars and dancefloor drums, it would sound like a typical indie rock foray were it not for the Glass Animals inspired, lurching bridge and frontman Kris Leonard’s nasal Cheshire drawl. During early coverage, the band were reluctant to mention real life influences, but UK indie runs strong throughout all of these tracks, not least of all “Really Wanna Call,” which is the weakest offering simply because it’s so stereotypical of the scene. Most poignant are the songs that offer something a little different from standard, because these are the instances where you can hear the makings of the band proper. “Drunk” has a title that lends itself to lad culture, but in fact the song swills and swells around a melodic hook that conjures up an image of Vampire Weekend slow dancing with Sylvan Esso. “Call You Up” slows things down even further still and is the ballad of the album: an intelligent slice of indie pop masked behind a tale of alcohol-fueled debauchery. Perhaps the most important thing to remember when listening to this album is that, despite how it presents, this is not a finished project. Viola Beach’s story is very much unfinished, and regrettably it must remain so. That they produced these nine tracks—average at times, but always well-structured and ear catching—within just two years makes the whole affair even more catastrophic.